This blog contains policy briefs, development tools, and examples of existing trauma-informed policy. Examples of existing policy are arranged by state. Description: This report was created to facilitate developmental juvenile justice system reform for girls. It maps girls’ current paths into and through the juvenile justice system; describes the social contexts driving girls’ behavior and involvement in the juvenile justice system; and details recommendations for an alternative, developmental approach to redesign juvenile justice systems to address harmful social contexts and girls’ resulting behaviors, rather than penalize and punish girls for challenges beyond their control. Description: The Collaborative shares three policy briefs on the impact of ACEs in the health, justice, and education systems including promising practices and recommended actions for change. Description: The National Girls Initiative and the Office on Violence Against Women (OVW) convened a roundtable to discuss the unintended consequences of mandatory and pro-arrest policies for domestic violence on girls and young women. This summary report resulted from that convening. Description: The Alliance for Strong Families and Communities & The Palix Foundation partnered to create an initiative called Change in Mind. This collaborative released this policy brief stating that policies that promote healthy development benefit us all, and people who have healthy brains are more likely to become responsible and successful students, workers, parents and citizens. Description: This webinar takes a strength-based, racial equity, and community-building perspective to discuss new investment approaches for children in the first 1000 days of life. It offers new state and community investment approaches as potential bi-partisan solutions that address inequities and persistent structural barriers to health care, education, housing, and employment, particularly in neighborhoods and communities most affected by these inequities. Webinar recording, slide deck, policy plan (Prenatal to Age 3: A Comprehensive, Racially-Equitable Policy Plan for Universal Healthy Child Development), and white paper are provided. Description: In this webinar, experts will explore policy challenges and lessons learned in promoting and supporting trauma-informed schools. Speakers will share key NCTSN resources related to the development and implementation of trauma-informed schools; discuss the relationship between practice and policy in the sustainability of trauma-informed school models; and share examples and insights gained from the creation and implementation of a trauma-informed school in Los Angeles, California. for addressing immediate health issues associated with trauma and ACEs. Description: This is by no means an exhaustive list of policies and activities, but this document provides an overview of some major policies, initiatives, and events in eight countries, including the U.S. Description: Florida, Wisconsin, Massachusetts, California, and Washington State have passed laws and resolutions that address ACEs or trauma-informed practices. Description: The Chico Unified School District School Board in Chico, California passed a resolution in October 2016 declaring November 2016 "Butte County ACEs Awareness Month." Attached is a copy of the resolution, which describes the efforts of the School Board to continue to move towards a trauma-informed school district. Description: Tarpon Springs, Florida is the first city in the country to declare itself a trauma-informed community. The effort is led by Peace4Tarpon Trauma Informed Community Initiative, a grassroots organization designed to identify and address the root causes of challenging issues (such as domestic violence, bullying, unemployment, poverty, and substance abuse) through community partnerships. In so doing, Peace4Tarpon aims to build a connected and trauma aware community that is a healthy and resilient. Read more of Jane Steven's story in ACEs Too High News. Description: This is a resolution relating to the use of current science of childhood brain development, adverse childhood experiences, and toxic stress to prevent child abuse and neglect. It also calls for the formation of a task force focused on the development of trauma-informed policies and practices in Minnesota. Description: The Public Health Advisory Board of Whatcom County, Washington, developed a resolution recognizing the importance of a compassionate approach particularly in public health service delivery. The Whatcom County Council approved this resolution on October, 29, 2013. A copy of this resolution is attached. 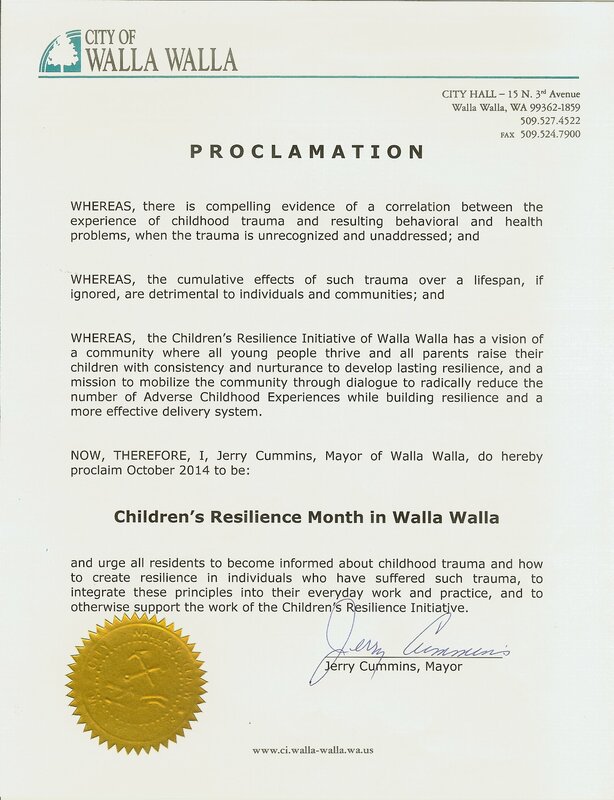 Description: In September 2013, the Walla Walla City Council issued a proclamation in response to a memorandum of understanding developed by the Children's Resilience Initiative (CRI) team that recognized the CRI’s efforts to make Walla Walla a trauma-informed community. As a result, October was named Children's Resilience Month in Walla Walla. Read more about the 4th Annual Resilience Awareness Month in Walla Walla here. We'll have a separate place for all the ACE initiatives (state, city, county), Bob. This section just covers policy and legislation. Elizabeth Prewitt has been following state resolutions & laws, which can be found in the link above. Might we add, or at least note, the nine US and one Canadian initiatives noted in the "Community Resilience Cookbook" ? I thought the reference to the rural Maine Schoolbus Driver who doesn't start the bus, until he's made eye contact with every pupil on his bus, was noteworthy. Lest I forget, while it wasn't listed in the Community Resilience Cookbook, the national SPSCOT (State Personnel Systems Coalition On Trauma)..[national] network started by Maine Trauma advocate Ann Jennings. Vermont's 2013 Legislature reviewed House Bill 762, requiring all Vt. Health Care Providers to screen ALL patients, regardless of age, for ACEs. I was led to believe only one of eight sections in HB 762 passed that legislative session. There was concern about who should ask which age-ranged patients what specific questions. On-going communication with one Vermont state Representative has advised me that concerns are still on going, but a Pediatrician/State Representative is still the prime sponsor of that bill-as of the 2015 legislative session. I noticed that only the opening and closing slides were provided as well. Please provide the entire slide presentation when possible. Slides are missing - only title slide and closing slide. Thank you for your suggestions, Jessica! We've added both resources into the list. Thank you for your suggestion, Vladimir. We've added You Have the Power into the list! I"m looking for a presentation to share with middle school and high school students. One that has a strong focus on building resilience. Can we add this post to Gail's new Trauma Informed Agency Champion group?